Gift shopping for someone who would LOVE the chance to get out on the water in Noosa on the Sunshine Coast and learn to surf? Then this is the perfect gift for them! Offering them the chance to paddle out and ride a wave with the help of an experienced guide, they'll be able to celebrate a special occasion and make some incredible memories all thanks to you! Choose to gift three 2-hour lessons or five 2-hour lessons, with lessons operating daily from 10 am to 2 pm. Have a look at the two gift options below and Gift It Now or Gift It Later, either way, you'll sure to be a Gifting Genius! With a few helpful tips and the right equipment, you'll be well on your way to experiencing the joy of gliding over the waves with these surfing lessons! Know someone who is itching to learn to surf? Then this is the ultimate gift for them! 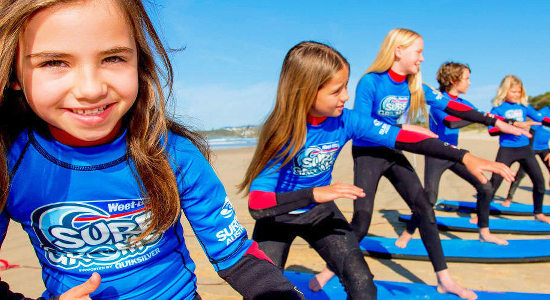 They can learn to surf in Noosa with these 3 two-hour lessons! If you're looking for a gift for someone who loves the outdoors & trying new things, then this voucher for 5, 2-hour surf lessons in Noosa is the way to go!